Culms: Erect or bent abruptly, tufted or solitary, slender, simple, hollow, smooth. Blades: Flat, spreading, 3 to 10 inches long, .25 to .6 inch wide, tapering to both ends, rough and usually thinly-hairy above, smooth below. Sheaths: Open, not keeled, smooth to rough or hairy. Ligules: Short, minutely-fringed membrane, truncate; auricles conspicuous to rarely absent. 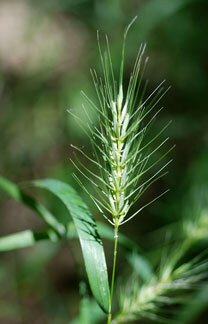 Inflorescences: Spike, erect to nodding, loosely-flowered, 3 to 6 inches long including awns, terminal. Spikelets: Very short-stalked; mostly in pairs, 1/5 to 3/5 inch long (exclusive of awns), initially ascending but horizontally spreading at maturity, 2-4-flowered; glumes usually absent but some spikelets bearing 1 or 2 short, scale-like or bristle-like glumes up to 1/5 inch long; lemmas lanceolate, 1/3 to 1/2 inch long, rigid, rounded on back, pubescent to glabrous, long-pointed, tapering into long, slender awn. Habitat: Moist or rocky woods. Uses: The Iroquois boiled the leaves with reed grass roots as a medicine to soak corn seeds in prior to planting.